I have used the Fontsquirrel @fontface Generator to create the CSS for the three fonts I am using. The fonts are displaying properly in every browser including other versions of IE -- but IE 9 is not displaying the fonts. I haven't had any luck with the searches I've done, any insight would be much appreciated. Thank you in advance. 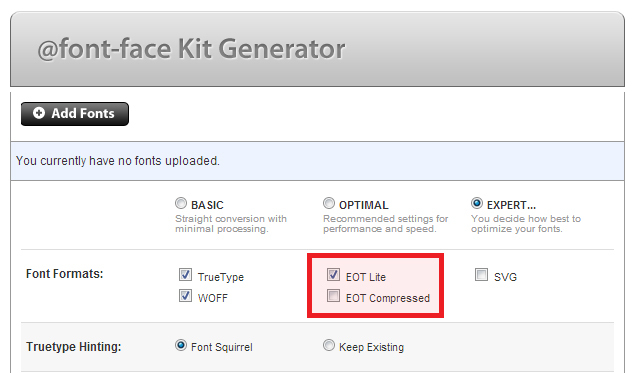 I fixed the problem by generating the font files again using the Font Squirrel generator. The fonts now work in every browser. I was having a similar problem where the icons would not show up in any version of IE with Font Awesome. I simply changed the format for IE from "eot" to "embedded-opentype" and that corrected the issue. Not the answer you're looking for? Browse other questions tagged internet-explorer-9 font-face or ask your own question.